Speaking humbly of their Grammy nomination, Matt Schultz is all about making music. While his style may have changed slightly in their most recent release, his attitude seemingly has not. Check out my interview below where we discuss working with Dan Auerbach of The Black Keys on Cage The Elephant’s new album, Tell Me I’m Pretty, classic movies, and more! Your vocals on the new album have transformed a bit from that rambunctious rock n’ roll sound to quieter vocals and more acoustic guitar. Were there any specific reasons or motives behind that transition, other than provoking emotional responses from listeners? What’s been kind of funny, is I’ve always leaned a little more heavily into a folk sound, but the kind of artists that I listen to most of the time are more towards Bob Dylan, Neil Young, Paul Simon, guys like that for my own listening. Which is kind of funny because I think that’s probably not so frequently portrayed in the music that we make until recently. I think the most [difficult] on this record was practicing restraint. I had some really great creative conversations with friends over the past couple years. One of the conversations [I] had, I was talking to a friend who was an actor, and [we] were talking about how in everyday life, a lot of people tend to downplay emotional response. It’s much more reserved. When you’re given the license to express an emotion, a sentiment, or a feeling – a free license – sometimes people will give an honest portrayal of how they actually feel, which doesn’t read as real, because in everyday life, we’re constantly contradicting in the way we project those things. The idea is that we’re always restraining ourselves and when you’re given the opportunity to do whatever you want, sometimes you take advantage of that and you go overboard. It’s not even overboard, you’re just being honest, but it reads as overboard because we’re constantly restraining ourselves. The idea was to have the same kind of intensity and have that tension there, but restrained. I don’t know if it really worked, but that was the idea behind it. You’re known for your explosive, unruly, live performances. How do you think that will translate live, with the more emotional and personal tracks on Tell Me I’m Pretty? I think this record doesn’t necessarily ask you to move around, or be chaotic. It’s more of being a thing, or something to stand in the sentiment of the song, rather than moving for the sake of entertainment. I don’t think it’s going to be any less animated, or anything like that. I’m hoping it’ll be a little more impactful, because it’s a solid thing I’ll have to be during the performance, rather than just relying on my nervous energy to carry it through. What specifically do you think Dan Auerbach brought to this album as the producer and do you think the fact that you had toured together in the past brought a special something to the recording process? I think Dan brought a lot to the recording process and the further we get away from the whole experience of recording, the more I realize how impactful he was during it. He bases a lot on reaction and mostly first reaction, so he’s really good at keeping you from holding yourself back, or getting in your own way – as far as overthinking things and that kind of stuff, self-sabotage. He also has a super strong grasp of tones and textures and how to make those things work together. Balance, how to create a classic sound that doesn’t feel like your grandparents music, that doesn’t feel archaic. Those are just a few of the things. He’s really great too at toning things down, but in a way that makes the song more impactful, creating more space in a track. You’ve been highly acclaimed even since your sophomore album hitting number 2 on the Billboard Top 200 chart in 2011 as one of the top rock albums of the year. It’s said that Dan emphasizes first takes, how did that affect the writing and recording process? I think it affected it dramatically. In the past, we’ve spent sometimes very little to hardly any time at all working on material before we went into the studio. Then what we would do is just build each song in the studio. Everything was under a microscope, to where we would structure a song, tear it apart, look at it, see how the pieces worked, [and] put them back together, until we found a balance of what was wanted. On this record, being the first record without Lincoln and with a new producer, we spent extensive time working on the songs prior to going into the studio. So I think that was one of the things that was a big difference on this record [as well]. How would you compare that process to that of Melophobia? They’re both good, I like them both. There’s so many different ways to explore creativity, and I don’t see any certain way as being the best, but I think each time you’re just looking to discover new things that you can apply to the next process and hopefully get a little better. It’s funny, I think sometimes we always perceive growth as movement forward and I think that it’s very important to remember that sometimes you have to move backwards, sometimes you have to move to the side, things like that and pick up certain things and continue on. We had really wanted to get back to a more classic sound. On Melophobia we spent a lot of time working on songwriting and structuring and also just on big production and on this record it was a much simpler approach and we wanted to get back to a more raw, more gritty sound, a more classic sound that couldn’t necessarily be pinned down to a specific time period. When you’re thinking about that kind of thing, especially when you’re presenting it kind of in this I wouldn’t say Rock N’ Roll package, but definitely influenced by Rock N’ Roll and I think it has a lot of that in it. Cage The Elephant’s new album, Tell Me I’m Pretty, featured Dan Auerbach of The Black Keys as producer. What kind of influence, if any, did The Black Keys have on the album? I don’t know if The Black Keys per say had any influence on the record, I would almost even argue that Dan’s a very strong songwriter, but I think his real strong suit might be his production. His fingerprint is undoubtedly on the record and that was a very conscious decision on all of our parts together. There’s not a lot of guys that are performing that kind of sound at the level that Dan is. I definitely wouldn’t call that a Black Keys sound, there’s a lot of bands that have done that sound in the past, I think Dan has just been one of the more successful ones. Headlining the KROQ Halloween Costume Ball in LA, the release of “Mess Around” and pre-order of Tell Me I’m Pretty all happened the day before Halloween. Was that purposeful and how exciting, stressful or relieving was it to have that all happen in the same day? I don’t know if it was purposeful. I’m sure it was to someone in our team, our management or someone who planned it out, but I really didn’t have much involvement in that. I generally stay stressed out, so it wasn’t like it moved the meter much for me. I think relieving is the word. With this record, for some reason it just seems like each record we make, it becomes more difficult for me. Not necessarily the task, or what it demands, in honesty, with every record, I’m always striving to be a little more transparent – to learn something. In the past, when I was younger, I put so much stock in persona and I feel like that really hindered the potency of whatever it was that I was writing. By listening to a couple songs in the past couple years, I realized when people were very honest, it sounded way more poetic than say writing to be perceived as poetic, or intellectual, or something like that. So with each record I’ve been trying to be more transparent and vaguely specific. On this record it got to the place where it was just a little too close, almost like each song was a journal entry, and if you have any deep seeded hatred of yourself like I do, I had a little trouble enjoying the record or even believing that others might enjoy it. After we released the record and saw the response, the nice thing is that I’ve been able to go back and vicariously enjoy it through other people. The video for “Mess Around” featured footage from the 1902 film A trip to the Moon and other Georges Melies, what was the inspiration behind that? I had seen a remastered version of A Trip to the Moon where Air did the soundtrack to it. When I first saw it, I thought maybe in recent times they had hand colored the film with digital technology. I at first was inspired and thought that would be a great way to do photographs of the band and started to research it. Then we started thinking about making a music video that way and when I started to look up creative groups that did that, I found out they didn’t exist. Then when I dug deeper, I realized all that stuff was done in the early 1900’s, late 1800’s and they had these hand tinting companies that had like 200 artists on the floor. They did it like an assembly line, each artist would be assigned a color and then the frame would be passed around and they would color whatever object they were coloring, which is why some of the colors popped around in different places, which is really awesome. It was actually mistakes, but it’s beautiful regardless. So I got fascinated, [but] realized we couldn’t make a video like that. I was really disappointed when I found that out. But then, my wife is French, and I was talking to some of her friends and they told me that some George Melies films were public domain, so we reached out to the organization that takes care of his films and they were really excited that we were interested in using them. Then we made the video that way. How did being nominated for a Grammy for Melophobia feel? It felt great. Hopefully you don’t make records to garner accolades or acknowledgments in that way, but it definitely was a confirmation of what we believed in the record and the direction that we were headed. We were really very flattered. You said that the inspiration was a plenty for this album and that after finishing the album, there was still material in your minds. 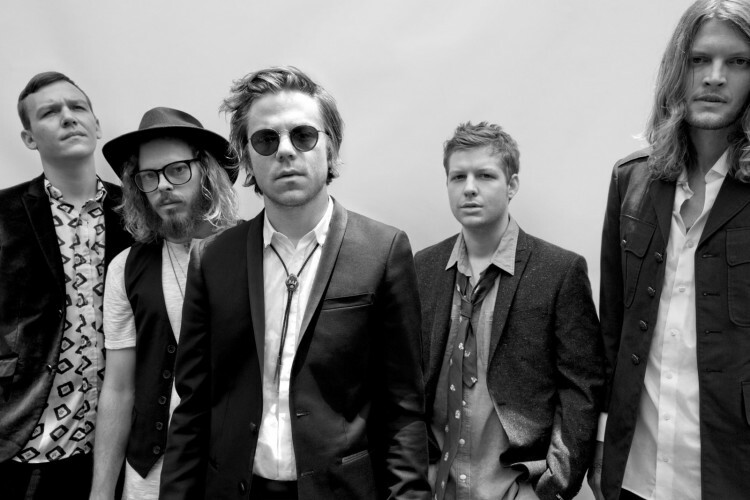 What can fans expect for the future of Cage The Elephant? I don’t know. Hopefully we’ll stay true to the convictions we have about music and that approach, as far as expressing certain sentiments and ideas, that kind of thing, but continuously evolve according to whatever learnings we pick up along the way of the creative process. You’ve toured with the Black Keys, Foo Fighters, Muse and Queens of the Stone Age. As musicians and personally, what did you take from those experiences? I think the biggest thing that I’ve taken away from watching a lot of the people that I’ve looked up to and bands and artists that we love is work ethic. Most of the bands that we’ve toured with have been extremely hard workers. I feel like the creative world is kind of like fishing. It takes a lot of time, you’re not always going to catch the big fish, but you’re hoping that every time you cast a line, you can catch a fish. With those guys and girls and groups, I think it’s just they’re consistent in how hard they work and how present they are.